So you've been playing for a while and gotten the hang of the game, but now you want to start customizing it. Be it with skins, mods or texture packs, customization is great and adds a new personal touch to the game. First thing you'll need is obviously a new skin. 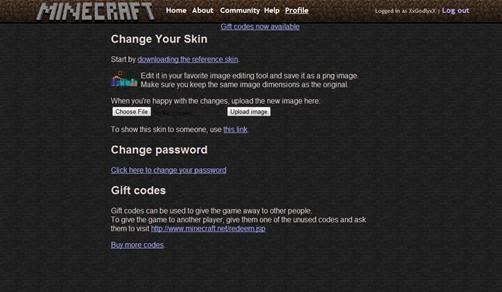 The most popular minecraft skin site is http://minecraftskins.com/. Where you can see user uploaded skins and which ones are the most popular. Pick a skin and download it. Head over tominecraft.net and log in. Then go to "Profile" which will take you to the page shown here, and then upload your skin. Once you've uploaded your skin it will show up in-game!